There you have it, folks! 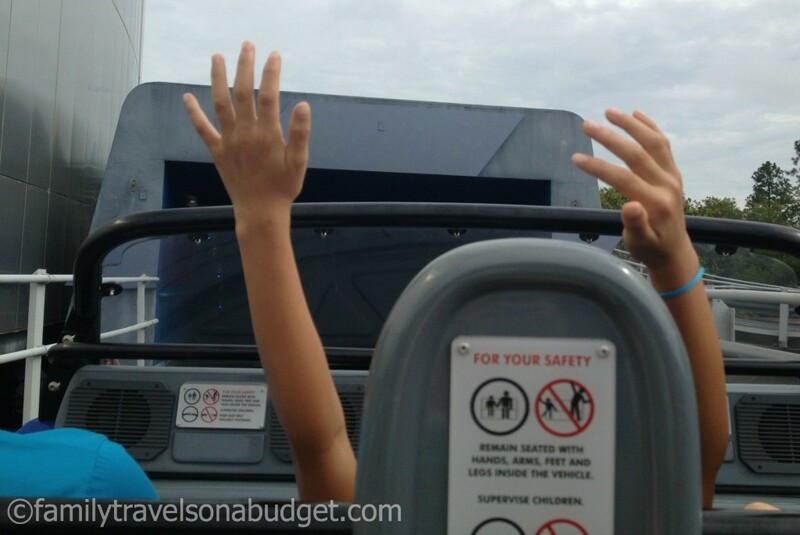 My daughter — who two days before riding Test Track at Epcot was terrified of all rides big, fast and loud — loves it! As for the rest of us… we think it’s pretty awesome too. What is the “new” Test Track at Epcot? We loved the original Test Track ride, but the cheesy video intro left a lot to be desired. The queue area, the cars, and even the ride itself looked tired. The new Test Track at Epcot, sponsored by Chevrolet, offers interactive features that make the ride entertaining time after time. In two days, we rode it four times — each experience a fresh thrill. Fast pass riders do not learn how these factors interact, so they do miss out on a bit of the experience. Left side: loading station to enter your vehicle data into the car’s computer. Right top: one of our car designs. Bottom right: Ben and I made high score at Epcot’s Test Track for the whole day! After designing your vehicle (there’s a five minute time limit), your vehicle gets “tested” against all other vehicle designs in your car to see which performs best in each area and overall. The new Test Track at Epcot runs on the same track as the original ride, but the entire place has been reimagined for a more futuristic experience. It’s loads of fun! And… it ends with the thrilling 65 mph ride on the outdoor track. After riding, park guests can create commercials featuring their concept car, use their concept car in a virtual video game, check their performance against other riders that day, and more. 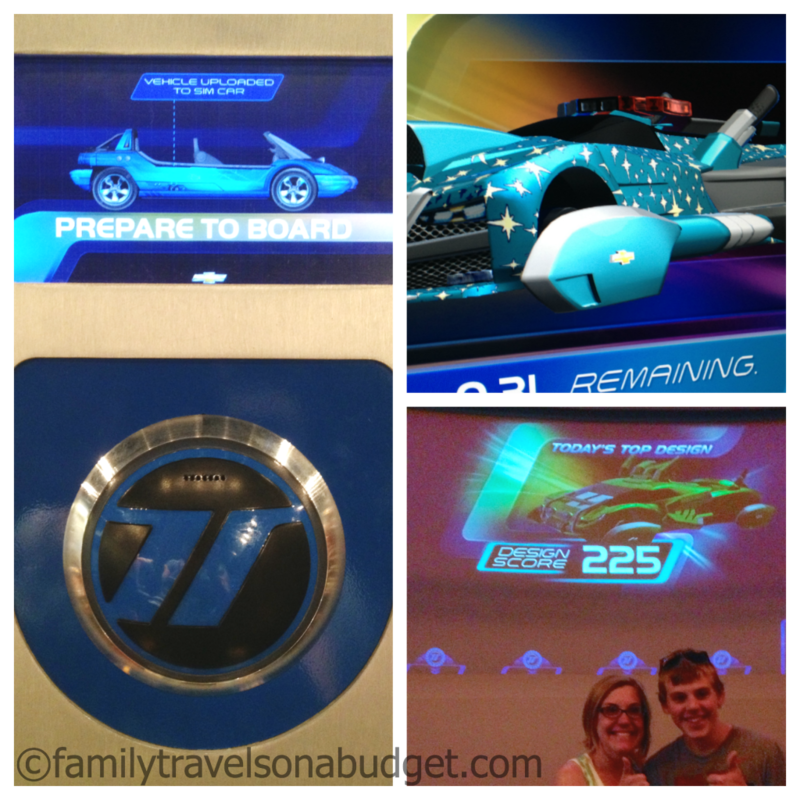 The changes to Epcot’s Test Track made for a fabulous interactive experience every member of our family thoroughly enjoyed. The line for Epcot’s Test Track gets long quickly. When entering the park, skip Spaceship Earth, Innoventions and other attractions to get here first. If the standby queue is 30 minutes or less, get fastpasses for later in the day AND ride now. It’s worth riding twice! Disney has changed fastpass rules, so if you ride using a fastpass, be sure to arrive during your scheduled time or risk not being allowed to ride. Remember you have only 5 minutes to create your car — don’t get too bogged down in details. Wider, lower cars tend to perform better overall. Allow young riders/non-competitive family members to select the color and decorations (last step) — just save some time for it! Test Track does shut down in inclement weather. If rain is in the forecast, make Test Track a priority! We emailed ourselves “commercials” of our concept cars and had a great laugh after getting home from our trip. Enjoy Epcot’s Test Track! 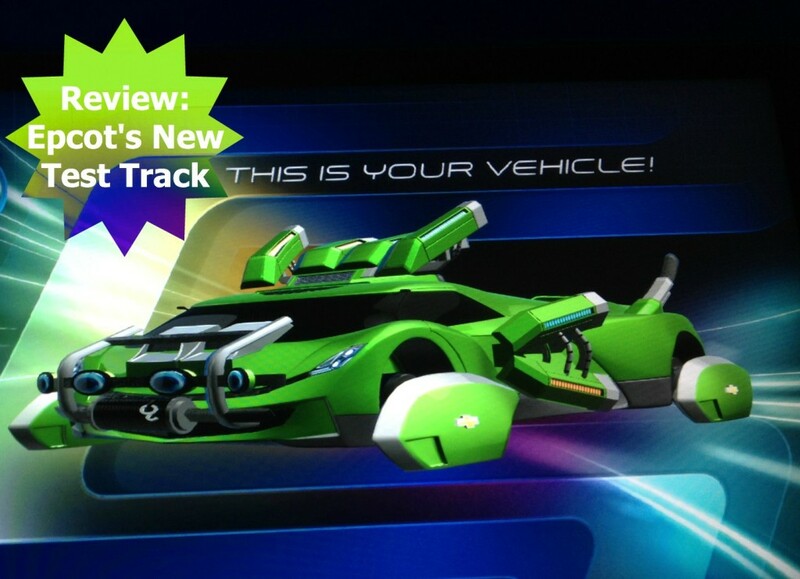 Have you ridden the New Test Track at Epcot? 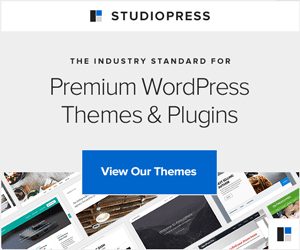 Any advice for our readers? What’s your high score? We are going to Disney in December. Thanks for the tips. Maybe I can finally beat my kids at a video game. The twins would love this. They adore anything cars and anything fast! Ahhh that looks so fun!! I’ve never been to epcot but it’s on my bucket list! Especially when the mama gets high score and beats out the men…. not that I’m competitive or anything! They did not have that ride when I was at Epcot-but being an adult (with no kids along) perhaps I just didn’t notice it. AND who says there are no flowery cars around–remember the old VW’s–people used to paint the with flowers all the time!! Shhhhhhh!!!! Don’t tell Ellie about the old VWs. It’s bad enough that she loves the eyelashes they sell for today’s VWs! They must have redesigned it cuz when we went like 8 years ago it was there, so that’s not very new lol. It was a blast when we did it, so I’m sure it’s even more fun now! Looks like so much fun, I need a trip to disney soon for my youngest…. Our daughter is 10 years younger than our oldest — it’s fun going through it all with another young one. Next time, probably not until grandkids — which better be a long way off still! I hope to take my grandkids there one day. This ride sounds like something they’d love to do. Thanks for sharing. They’ll love it. I am posting more on Epcot next week. Be sure to come back and visit! Sounds like a hit– when we went to Disney we didn’t even do Epcot–guess it will be on our list for the next visit.